DJs with disabilities need better access to the studio, says program director. For over a year now, accessibility has been a greater challenge than ever for CJLO’s employees and volunteers, especially those with unique accessibility needs. Between CJLO’s studio and an elevator sits the G-Lounge, once a bustling student-run café. 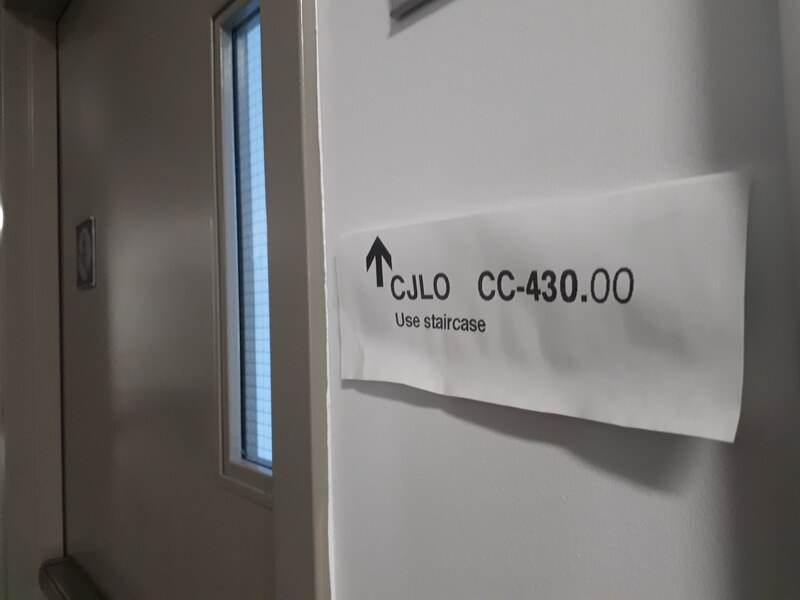 Allison O’Reilly, CJLO’s program director, said that when she first arrived at CJLO in the winter of 2017, the lounge was usually open and the elevator was easily accessible. However, it did not reopen after summer break that year. Since then, O’Reilly said, the space has always been locked and empty, with a few exceptions. “The inconsistency of it all is very frustrating,” she said. The G-Lounge had been run by Concordia’s Inter-Fraternity Council since 1973. Former G-Lounge manager Blake Snow said financial difficulties and understaffing, among other issues, forced the café to close. The room is now a reserved space, with bookings administered by the Dean of Students Office. Its doors are locked on both sides when not in use. O’Reilly is not concerned about her own needs, but instead those of others. “We have DJs and volunteers at CJLO who require access through the elevator because they have physical disabilities,” she said. Every Friday, CJLO hosts Audio Penpals, a music and talk show “with a focus on the disability community,” according to CJLO’s website. O’Reilly said many of the show’s hosts have non-visible disabilities. “A lot of the regular security people who work in the CC and the AV buildings are very helpful, very accommodating, they understand our situation, and I’m very grateful for them,” said O’Reilly. “But there has been the odd case where certain security guards have said some insensitive things towards some members of the station with silent disabilities.” She said this is likely due to lack of understanding of the volunteers’ disabilities. The elevator is not the only thing on the other side of the G-Lounge. “It cuts off access to washrooms for us as well,” said O’Reilly. There is a men’s bathroom on the third floor below the studio, but the nearest women’s bathroom is on the other side of the G-Lounge, which means descending to the third floor and climbing the stairs at the other end of the hallway. “I have no issue with security, I have no issue with Concordia, I have an issue with whoever runs the G-Lounge,” said O’Reilly. In an email to The Concordian, university spokesperson Mary-Jo Barr said the Dean of Students, Andrew Woodall, was aware of the situation. “He understands the issue and will be working on a solution with CJLO,” she said. The Concordian reached out to several DJ’s from Audio Penpals, but did not receive a response in time for publication.